For all legal/legacy/will enquiries, please call 01702 342131. 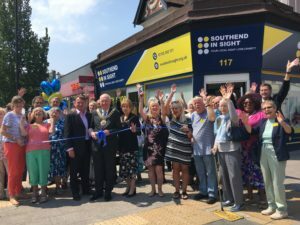 In 2018, Southend Blind Welfare Organisation celebrated its Diamond Jubilee; with the renaming of the community services division of the charity to Southend in Sight and a refurbishment of the centre to offer better facilities and accessibility. Over 60 years the organisation has helped countless people in the borough of Southend, live independent, fulfilling and active lives whilst living with sight loss. The charity has a proud history. It has always been and remains a local, independent charity, offering advice, social activities and practical help through clubs, hospital liaison and a team of volunteers who work tirelessly to make people’s experience of sight loss as straightforward and stress free as possible. 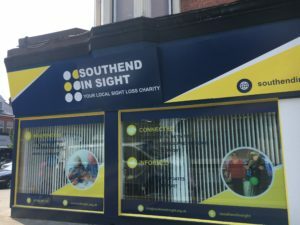 The organisation was set up in the 1950s by a group of local people who saw the need for a local charity that would help and support the growing number of people in Southend who were blind or partially sighted. Southend Borough Council and local eye specialists supported the aim and the charity was formed. The opportunity arose in the late 50s to buy a property, now known as Elkington House, in Imperial Avenue, Westcliff to open as a residential home that could offer specialist care to those with sight loss. Initially the home could accommodate 14 people. The organisation set up and ran social clubs for members in the community, and held an annual Christmas party at the Kursaal on Southend seafront. There was great support for the charity in the local area: local Service Clubs and the Southend Round Table offered fundraising and transport. The charity benefitted from a number of legacies and donations including from the estate of Annie Kay. Over the years, Elkington House has expanded and now provides care for 25 residents. It is named after Daphne Elkington, a social worker for the blind from Southend, and a long time supporter of the charity. In the late 1990’s, a centre was opened, initially at Elkington House, then at SAVS in Southend, finally moving to our current headquarters in Hamlet Court Road in 2008. This move enabled us to provide a club room, an enlarged centre, and a charity shop under one roof. The charity shop raises significant funds to support the Centre. In 2018, Southend Blind Welfare Organisation celebrates its Diamond Jubilee; with the renaming of the community services division of the charity to Southend in Sight and a refurbishment of the centre to offer better facilities and accessibility. Over 60 years the organisation has helped countless people in the borough of Southend, live independent, fulfilling and active lives whilst living with sight loss. The opportunity arose in the late 50s to buy a property, now known as Elkington House, in Imperial Avenue, Westcliff to open as a residential home that could offer specialist care to those with sight loss. Initially the home could accommodate 14 people. The organisation set up and ran social clubs for members in the community, and held an annual Christmas party at the Kursaal on Southend seafront. There was great support for the charity in the local area: local Service Clubs and the Southend Round Table offered fundraising and transport. The charity benefitted from a number of legacies and donations including from the estate of Annie Kay. We receive no state or local authority funding and rely entirely on voluntary donations to deliver our services to blind & visually impaired people in the community. Website Designed by I Am Emily Design & Marketing, and built by Digital Technology Labs.